Our circadian rhythm is the internal system that regulates when we fall asleep and wake up. This can go out of balance when we are ill, get stressed, worry, work shifts, experience jet lag and of course when the clocks change twice a year. 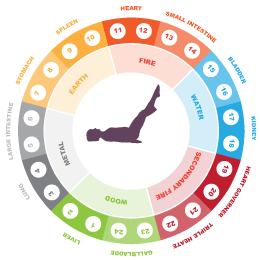 According to Traditional Chinese Medicine our energy moves through the 12 meridians in a 24 hour cycle and each meridian has a two hour period when its energy is strongest. We can use this system to determine what is causing energy imbalances, but also more importantly to re-balance our energy to get us back on track. In this workshop we will use the TCM body clock system to balance our energy with a more yang (since coming into spring) focused 90min yoga sequence working through all the meridians. You will also have the opportunity to learn a short Dao-In and Makko Ho routine to apply when time is tight, and finish with a soothing Yoga Nidra. There will be time for discussion with detailed handouts so as you can learn to address any imbalances yourself at home. So when the clocks go forward on Sunday 31st March come and reset your internal clock with this yoga workshop, and flow smoothly into the new time zone! And of course it’s for anyone who feels out of sync when the clocks go back as it’s the perfect time to realign our energy. 90 minute yoga sequence to align your energy with the new time zone. Graphic handouts and discussion so as you understand the principles. Time to apply the principles to your own personal clock using Doa-In, Makko Ho and particular asanas so you can use whenever necessary. Pranayama and Yoga Nidra to help settle the mind and body. Short break for tea and snacks (provided).